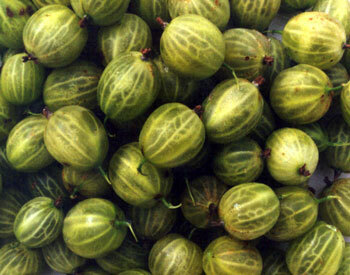 Gooseberries are a spikey, hard and tart fruit which is transformed by sugar into delights such as gooseberry crumble, gooseberry pie, gooseberry jam and puree, which is delicious served as a sauce on ice cream. Dessert gooseberries are a recent addition to the farm. The purple-red fruit is quite sweet – proving to be a popular newcomer. The traditional method of growing gooseberries as a bush is used with some of the crop. We have also introduced a trellis system to train some gooseberry bushes on wires. This growing-method exposes the fruit making it easier to pick. 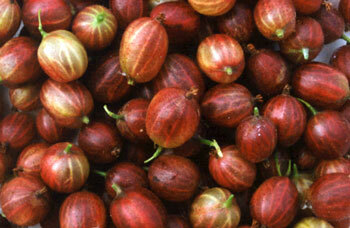 Pax is the red dessert gooseberry; it has no thorns and fruits latest of all the gooseberries. To ensure you can enjoy the best quality fruit, check out our advice on picking and storage. Gloves give protection from thorns, and a kneeling-pad helps picking from the lower branches. Unlike other berries, gooseberries are not spoilt by washing in cold water. Gooseberries freeze well. ‘Topping and tailing’ fruit is not necessary, but many people prefer to.